Since high school, I have been fascinated by geometry. I enjoyed constructing the more complicated Platonic solids with ruler and compasses, as well as reading about the fourth dimension. I went on to study physics at the University of Basel, and in 1970 started working at Bell Telephone Laboratories on the design of charge-coupled imaging devices. There, I was introduced to the field of computer graphics in courses given by Ken Knowlton and Lilian Schwartz. In 1977, I joined the faculty of the computer science division at the University of California, Berkeley. Inspired by a talk by artist Frank Smullin, I started to develop the Berkeley UniGrafix rendering system, so that I could depict objects such as the “Skeleton of a Klein Bottle” or the “Granny-Knot Lattice.” Since then, the focus of my work has been on computer-aided design. First, I developed programs to support circuit designers, later architects and mechanical engineers, and recently even artists. 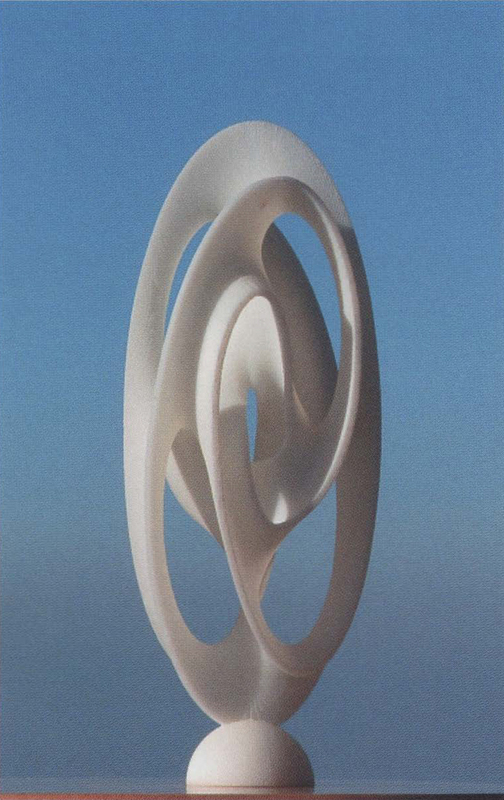 In 1995, I started a close collaboration with Brent Collins, who had been sculptini abstract geometric art for two decades. With my students, I developed a procedural “sculpture generator” program, to help Collins prototype potential future work in virtual form. Later programs generalized the original concepts and eventually expanded the design space through new paradigms. In this work, I see myself as a composer in the realm of pure geometry. “Totem_2” is the latest creation from a recent modification of the “Sculpture Generator I,” which allows me to create these elongated forms. It was created on a Fused Deposition Modeling machine. The design of the geometry of “Cohesion” dates back about three years, but was only cast in bronze in 2002 by Steve Reinmuth.